Nutritech Casein Slow Release is a slow digesting protein shake supplying muscle building amino acids for up to 8 hours. Fitness athletes and lifters need protein for muscle gains. They get protein mostly from meat and supplement with a shake at important times. Each serving provides 26 grams of slow digesting protein. When mixed Casein has a much thicker texture than Whey protein. Casein becomes a ‘gel’ in the stomach which slows down the digestion and absorption of the protein. The digestion process lasts between 6 – 8 hours. Drinking a slow-releasing shake is beneficial to preventing muscle breakdown as it supplies the body vital amino acids during digestion. A whey protein shake is fast-absorbing and best used before or directly after your workouts. Casein is ideal just before bed or traveling without access to quality food. To maintain the high quality standards of their products the manufacturers routinely use independent SANAS accredited laboratories for testing. Casein is truly a versatile shake. It can be used as an almost zero-carb / fat meal replacement drink or a sugar-free protein dessert. 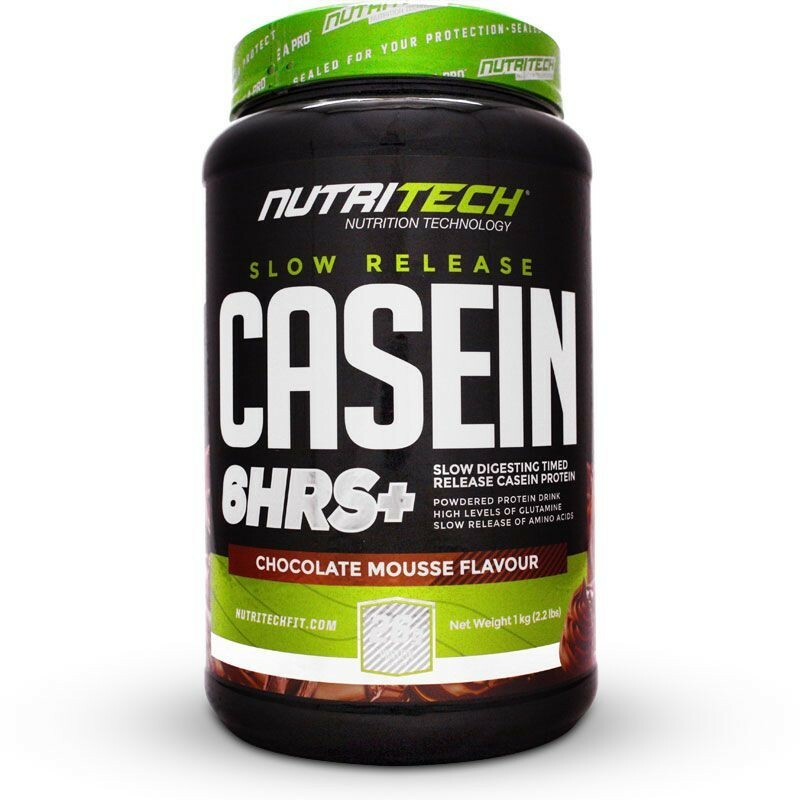 Nutritech Casein Slow Release offers athletes and lifters an excellent protein source when they go for an extended time without eating any food. Protein Blend (Calcium Caseinate, Milk Protein, Whey Isolate), Flavouring, Cocoa, Non-nutritive Sweetener: Sodium Cyclamate (E952), Sodium Saccharin (E954), Acesulfame Potassium (E950), Flavouring, Emulsifier: Soy Lecithin. Contains cow’s milk and soy. • Mix 2 scoops with 250 ml of cold water or milk in a shaker. • Take 1 serving before bed. • Can be used between meals when slow digesting protein is needed. Best product on the market, hands down. Gotta love Nutritech! So happy SW stocks Nutritech, now I can finally use them as my regular supplement shop again. Great Casein. Best local. Mixes easily, not too think, taste is good as well. Just not a fan of the Cookies and Cream, but the Cream Soda is great.